Original finnish defence forces Marksmans achievement badge. All conscripts ( exept the few who serve as unarmed ) have to pass certain shooting tests, the very best are chosen for sharp shooter training, but most will just achieve some merit after the baisic training is over, the regulations for the merits are change now and then, but the 1st class is always hard to get. All these badges are original, some have manufacturers stamps, some may not have, all are with butterfly clasp attachment, some minor scratches are possible, most likely 1980-1990 manufactured. 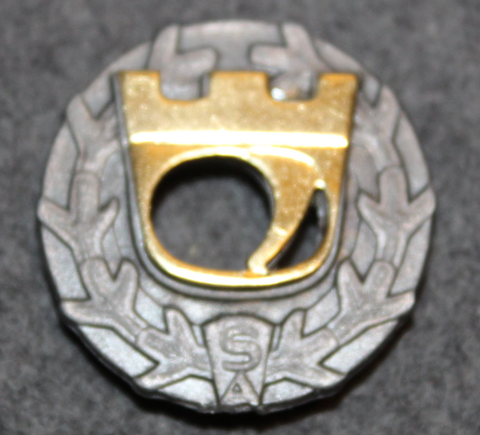 Danish qualification badge ( Udmærkelsestegn ). Pistol shooting.